One interface does it all. No additional interface needed. Pioneer, Kenwood, Eclipse – no problem the ASWC-1 works with them all plus many more radio manufacturers. Auto detects the majority of vehicles on the market today and programs the steering wheel controls automatically. Auto detects what radio the ASWC-1 is connected to. Updateable via a common micro B USB cable to ensure you have the most up to date inventory. 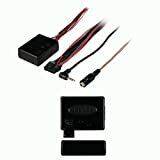 axxessinterfaces.com has a dedicated section for vehicle information to aid you in the install. Non-volatile memory retains the steering wheel control settings even if the battery is disconnected or the ASWC-1 is removed from the vehicle. The ASWC-1 can be manually programmed to most vehicles on the market.